What do you get when you pair an Italian designer house, famous for elegance and glamour with an American brand known for producing sportswear, casual style and khakis? You get the Valentino for Gap capsule collection, which features assorted pieces festooned with Valentino-style ruffles in very Gap-esque utilitarian colors and fabrics. The Valentino-Gap partnership was dreamed up to celebrate the expansion of Gap into the Italian market. With the Lanvin for H&M fervor having just died down, don’t be surprised if you see fashionistas camping out on cold pavement in Milan, London and Paris come November 26th, that’s likely the only way one has a chance of getting their hands on these pieces–aside from paying astronomical prices on eBay later. Why would sane women choose to sleep outside in order to get their hands on a pair of ruffled trousers or a great cotton bolero? Well, the chance of owning any type of Valentino for under the four figure mark is tempting to many. Add to that the fact that the seven pieces in the capsule collection are limited edition and the appeal just grows. These photographs of the collection show Valentino designers Maria Grazia Chiuri’s and Pier Paolo Piccioli’s ability to marry their line’s trademark femininity (and all those bows and ruffles) to the dark and rather drab colors and the functional fabrics (think cotton, khaki) favored by Gap to create a look that is rather special and quite unique. In this case, taking the very Valentino elements off the couture and designer accessories and putting them onto functional, causal clothes totally works. At first glance the Valentino for Gap pieces may seem to be missing a certain type of flair, but a closer look will reveal a certain element of whimsy that is endearing. 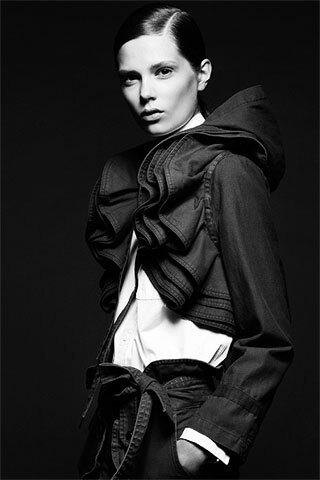 The line’s piece de resistance, in my opinion, is a long ruffled parka. The collection also includes a skirt featuring a large bow, frilly cargo pants, t-shirts and a hoodie. “We love mixing different cultures and we have been excited to mix Gap’s timeless essentials with our Roman culture of couture,” Chiuri and Piccioli recently told Vogue UK. “It brings together the iconic world of Valentino and Gap’s fashion staples, synthesising the current trend of combining luxury with basics.” The designers’ reported favorite piece? The cropped jacket. Unfortunately for those in North America these pieces aren’t slated to be available on this side of the pond. Instead, of November 27th, the limited edition capsule collection will go on sale at the new Gap store in Milano, the Gap in London (and Dover Street Market), as well as Colette in Paris. Will you be lining up for yours?